Last October the 30th 2016 was the 25th anniversary of the cold autumn morning when Madrid became the centre of the history of mankind. For the first time, after long decades of disagreements, disregard and violent clashes, the peoples and nations of the torn Near East accepted to gather around the same table and look to the future together to finally chase away hatred and war. All of us who lived that moment may not forget, should not give up reviving that contained emotion that all attendants felt back then. During those days were written and narrated in the Spanish capital city the first chapters of peace in the Near East. Taboos were broken, the door to definite peace was opened and even the more reluctant and sceptical demanded in their speeches that more time and more political and psychological maturity was needed to reach that shared dream of peace and reconciliation. Madrid lifted up the slab of historical misunderstanding between Arabs and Israelis. Madrid tore down the walls preventing communication, as if the Jericho trumpets depicted in the kufiya of Saeb Erekat, member of the Jordanian-Palestinian delegation, represented the unwaivable sign of a legitimate aspiration of the Palestinian people. The peace process started off in our city; however, until now it has not been able to culminate. Many were the stages covered during these 25 years. Some of them very positive. Not everything is despair in the Near East. The peace treaty between Israel and Jordan was subscribed. Part of the territories occupied in the 67 war were returned. Many times, negotiations between Israelis and Palestinians were on the verge of reaching a happy ending. Although Oslo changed the path and the method and made us waste time and focus in the search for a final settlement, some initiatives such as the Clinton Parameters, the Taba agreement and the Israeli Prime Minister Olmert’s proposals were really on the brink of solving the conflict. With Syria, we almost touched peace with the tip of our fingers, but a clumsy and arrogant negotiation by the Americans derailed reconciliation between Syria and Israel. In turn, Israel withdrew from the south of Lebanon, and surely when there is a positive context in the region reconciliation between these two countries will be formally sealed. It’s been tough years, with glimpses of hope, especially during the years in which Isaac Rabin championed the desire for peace of the Israeli people and understood that his Palestinian interlocutor Yasser Arafat was a serious and committed partner for peace. During these years, war, terrorism and despair have remained the main subject of the East Mediterranean’s dramatic story. Unfortunately, today this negative appreciation, this pessimistic feeling seem to have reached the international public opinion and, what is worse, world leaders, who have sheltered in a fatalistic and impotent exhaustion that paralyses them in the search for solutions. 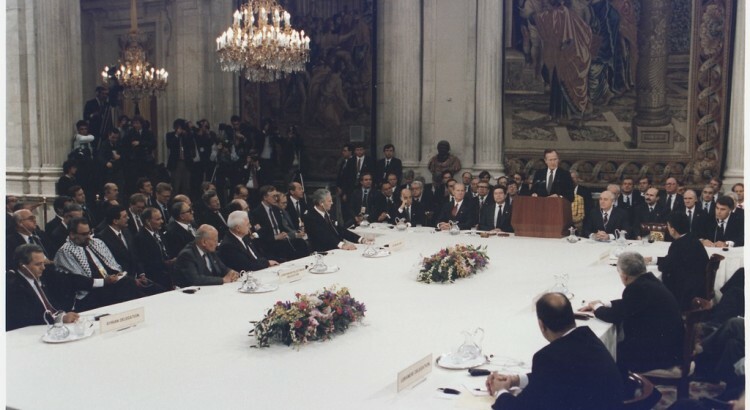 This climate of lack of interest and despaired apathy may well explain the fact that the 25th anniversary of the Madrid Peace Conference has gone completely unnoticed, an ignored commemoration. No one has made any reference whatsoever, neither in political nor in journalistic milieus. What is worse, our diplomacy, the Spanish diplomacy, has not wanted or not been able to take advantage of such a relevant asset as the Madrid Peace Conference. Let us hope that, once the new Government is formed, this oblivion can be compensated and this historic milestone reclaimed to review progress made in these 25 years of peace process and find a solution for the current standstill. I know for a fact that Prime Minister Benjamin Netanyahu always remembers Madrid as a key milestone in his political life. I also know that Palestinians are eager to find a way to unblock the impasse of these last years. And it would not be surprising that President Obama may consider, once the American elections have taken place, that his last contribution to peace as President should be committing to get this process back on track. The glance on this region turns now to the cities of Aleppo and Mosul, where decisive battles necessary to restabilize Syria and Iraq are being waged. But the international community should focus on another diplomatic battle, in my opinion even more crucial, which is managing to establish the “two-State solution” for Israel and Palestine, so that they may live in peace and security. Madrid could well be the venue for this new diplomatic struggle, convening once again all actors to write the final chapter of this peace project. We cannot accept that this peace should be forgotten. Without it there can be no future for the whole region.